On May 20, 2016, the Food and Drug Administration (FDA) finalized the new Nutrition Facts label for foods—but the FDA has extended the deadline since then, without establishing a new deadline. The new second edition of our book, Blood Glucose Levels and Diabetes Control—the first book in our Diabetes Leading Edge Seriestm—contains a section on the new labeling. We’re posting the entire section here, as a blog. It’s a bit on the long side for a blog, but it will introduce you to our style, in case you haven’t read any of our books. The FDA requires food labeling for most prepared foods, but nutrition labeling for “conventional” foods—fruits, vegetables, and fish—is voluntary. The labeling revisions reflect the latest information about the link between diet and both obesity and heart disease. They highlight calories and servings, and indicate the number of grams of sugar added to a food. Consumers will be able to use the new label to make better choices about what they eat and the food they feed their families. Some food manufacturers already use the new label. Those whose annual food sales total less than $10 million were given until July 26, 2019 to comply; however, as noted above, FDA has now extended the deadline. The new label has several key changes. It zeroes in on added sugars, reflects new thinking about fats, updates serving-size requirements, and adds some required nutrients. Under the current draft, labels will give a percent daily value (%DV) for added sugars, but will continue to list grams of sugar. “It is difficult to meet nutrient needs while staying within calorie limits if you consume more than 10 percent of your total daily calories from added sugars,” the FDA said in a news release. 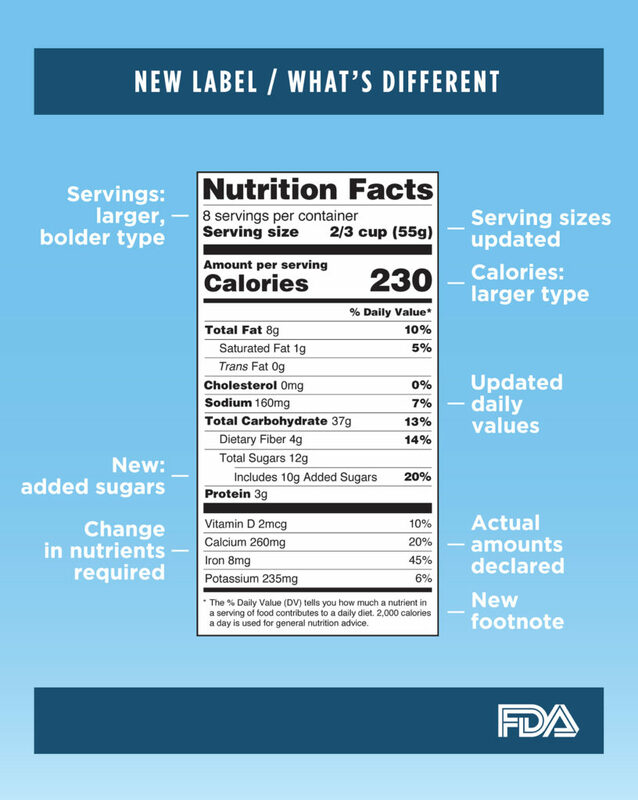 The new label will remove the listing for “Calories from Fat,” but leave the “Total Fat,” “Saturated Fat,” and “Trans Fat” categories. Research has shown that the type of fat consumed is more important than total fat. Below is an illustration comparing the old and new labels for a hypothetical product. 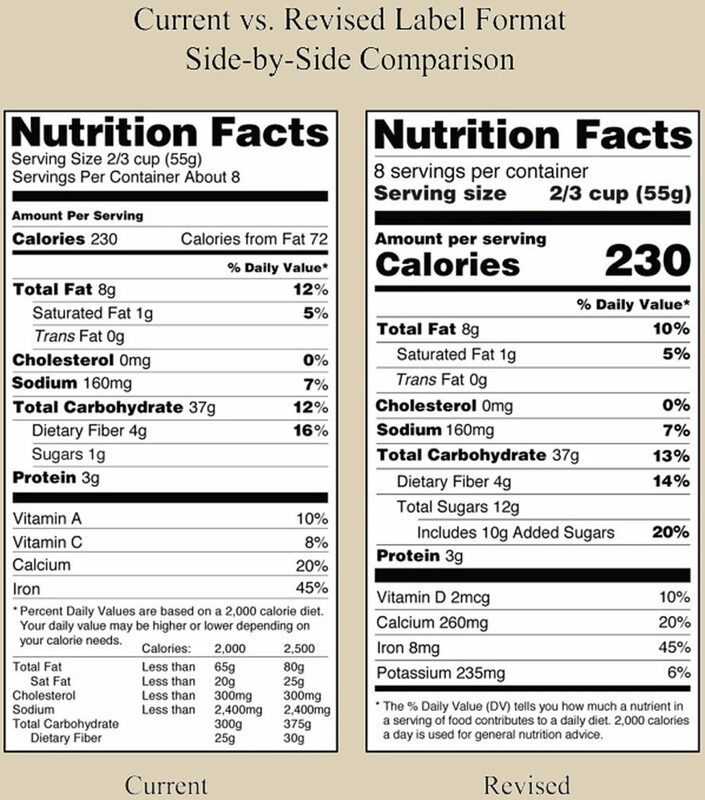 Note several changes: the listing for serving size, the emphasis on calories per serving, and the entry “Total Sugars 12g, which, as the label notes, includes 10g Added Sugars,” for a total contribution of 20% of Daily Value (20%DV).